Yesterday I have been experimenting with adding new keywords to Markdown mode in Emacs. Because I use Markdown with some of my own rules for my tumblelog Plurrrr I wanted some additional high lighting, font locking in Emacs jargon. Each day in my blog input file consists of a date in ISO 8601 format, optionally followed by a title for that given day. Since a date doesn't stick out by itself I decided to assign a color to it. Or: at the start of a line match an ISO 8601 date string followed by zero or more characters. So, now I had my regular expressions for the keywords I wanted to highlight. Next, I had to pick a face for each. For the ISO 8601 line face I picked a dark orange color: #b13120 in hexadecimal notation, and a bold font. For the heading level 2 and higher face I picked a brighter orange color: #d94a05 in hexadecimal notation, but also a larger height of font. Moreover, after some experimentation with the height I turned bold off. 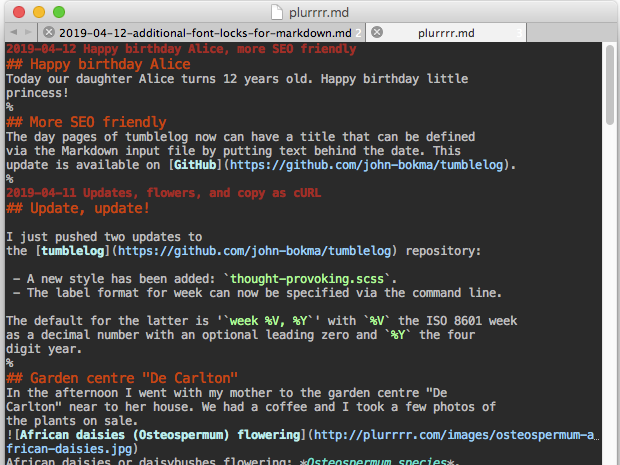 Plurrrr's Markdown file with additional font locks in Aquamacs 3.4. This works really great and makes it very easy to find back the various sections of my microblog.